When logging into the sixt website (sixt.com) 1password logs in properly and then fills in all the fields with the username (email address). Hello, @richardburt! Thanks for reporting this. Am I correct in understanding that these fields are filled with your e-mail address after signing in to the website? The sing-in form is filling fine for me, but I don't have a Sixt account, so if this is something that's happening after signing in, I won't see it. Thanks! Yes it happens after signing in. Do you see a pop-up window once you sign in on their website? Are you able to reproduce this issue if you restart your computer? Please let me know. Thank you! I've made a screen recording of it. With 1P enabled what you see in the video is what happens. With 1P disabled the site behaves as expected. Thank you for the video. I guess I know what is going on. 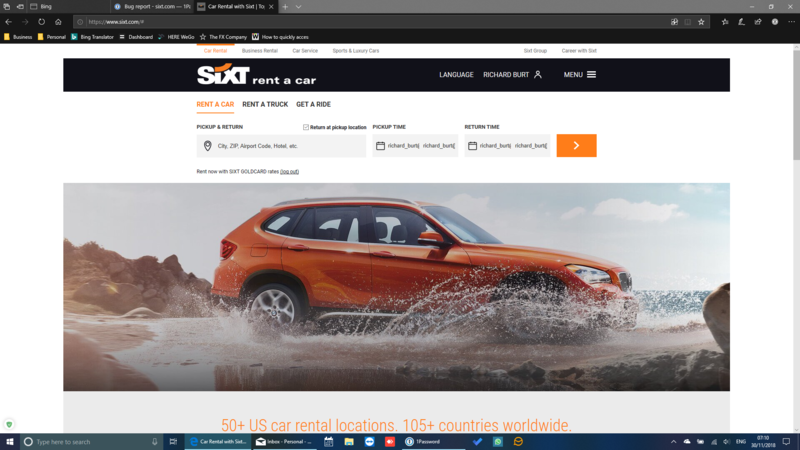 Sixt.com do not have their sign-in form on their home page (it is a pop up, when you click Log in), so if you want 1Password to fill in your credentials, you should click Log in first, then open 1Password extension, and select Sixt from there. Let me know if it helps. Thank you!